Mayor Luke Bronin (second from left) met with members of the Youth Service Corps at a park they recently cleaned up on Bellevue Street in Hartford. On Thursday morning, Mayor Luke Bronin stood at a podium that sat on a bed of mulch. He was in a city park to talk about how $2.5 million raised in private funds will push his Youth Service Corps program into year two. Where he stood used to be an empty lot that featured a forgotten pile of dirt. He was joined by some of the 278 people that had made this initiative a reality. 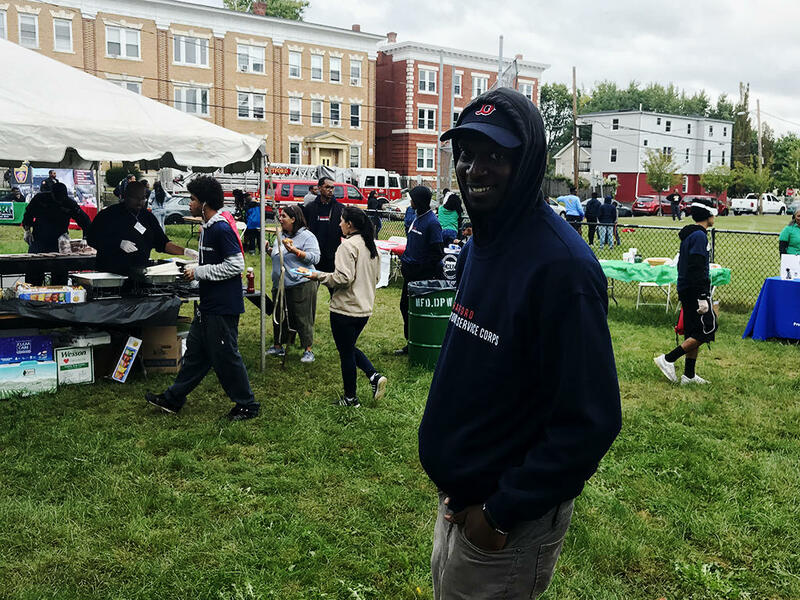 “The men and women that you see behind you, who have made the decision to participate in this Youth Services Corps, are doing it both because they care about their community and because they care about their future,” Bronin said. The idea is to get Hartford youth aged 16 to 24, who would otherwise be unemployed, minimum wage work through community service projects. The city said that 144 of the participants made it through the program in year one. Rodney Carr is one of them. He’s 23 and he was late to our interview earlier this week because he was taking care of his three-year old daughter. She had whooping cough. Rodney said he makes about $300 a week through the program. He needs that money because he said he spends $70-80 a week on his daughter -- on Pull-Ups and for transportation to get her where she needs to go. But he wasn’t always able to provide for her. When she was born, he was in jail. He got into the Youth Service Corps within days of being released. He said he’d like to get his commercial driver’s license, one in cosmetology, or whatever he could get his hands on through the connections he’s made through the program. Before Cruz joined Youth Service Corps, he had been arrested multiple times and was expelled from Hartford Public High School. Andy Cruz, 19, is also a member of the service corps -- he’s using it to turn away from a past that includes multiple arrests. Cruz had been expelled for not showing up to the first month of his senior year at Hartford High School. Sometime later, he was at a park when his friend confronted him. “He had told me, ‘Hey, you don’t want to be out here chillin’ all the time.’” You want to make some money. Do something for yourself,’” Cruz said. 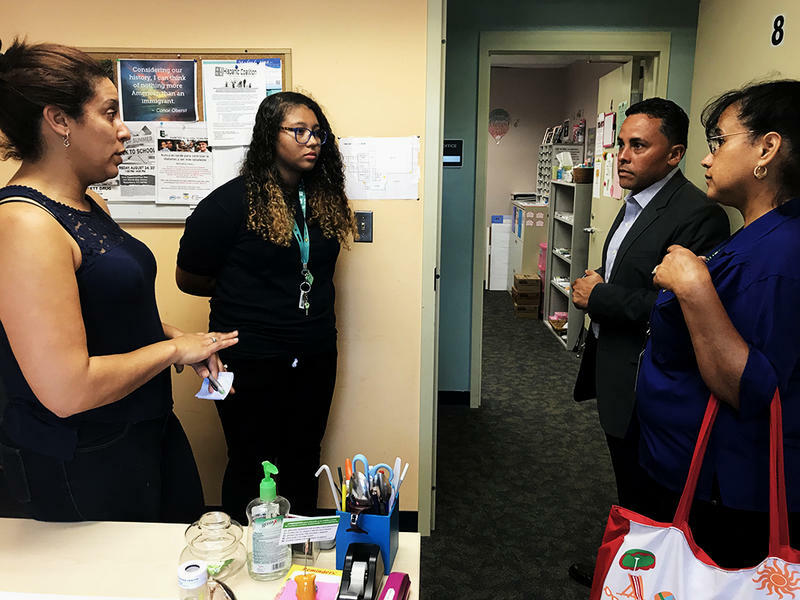 Even though the city said a referral is needed to get into the program, many of the Youth Service Corps members made contact with city personnel on the phone or online to request interviews. And if they did well enough in an interview, they were accepted. 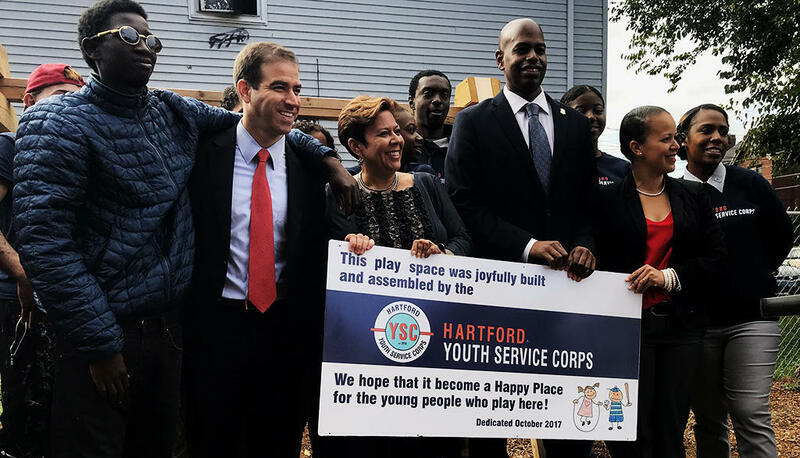 The Youth Service Corps celebrated a rebuilt playscape at Clay Arsenal Park on the north end of Hartford on September 30. Tremaine Stamps was there. Tremaine Stamps got in that way. Unlike Carr and Cruz, Stamps has never been arrested. Youth Service Corps is more than just a place to rehabilitate criminals. 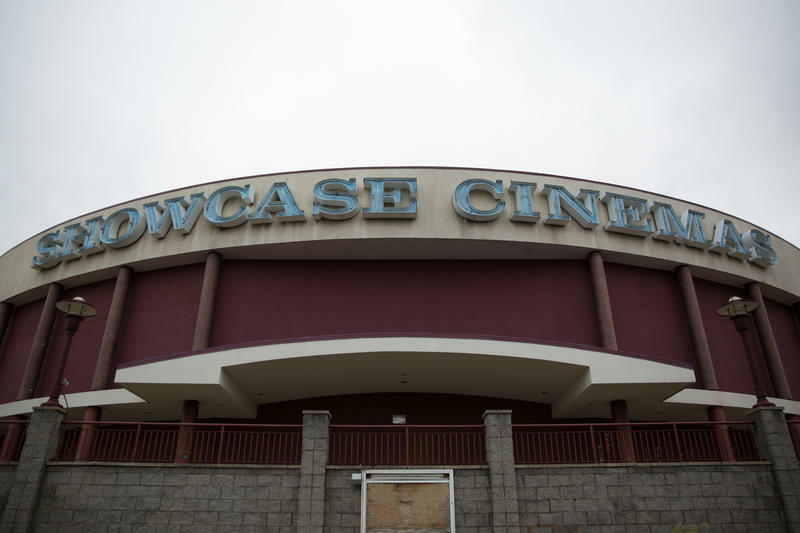 It’s a venue for Hartford residents like Stamps who want a shot at a brighter day, but may not have the same opportunities as other kids their age. 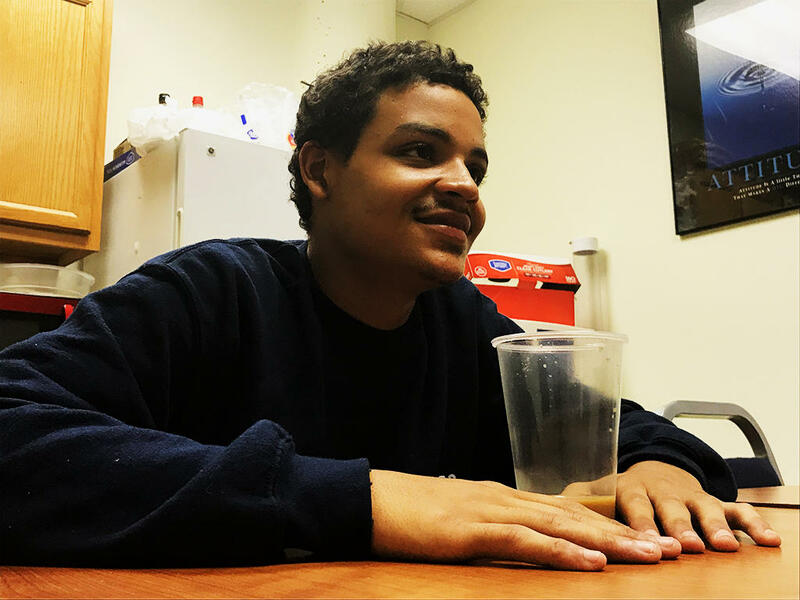 Our Piece of the Pie, the Hartford non-profit that administers the service corps, has gone above and beyond to help him get his Associate's degree at Capital Community College. He’s hoping next to pursue a Bachelor’s in social work at Springfield College Stamps wants to be able to influence a future generation of Hartford youth. “It’s always good to be a role model for the kids because in this type of community, kids need responsible people to look up to,” Stamps said. Year one of the corps officially came to an end on July 31, according to the city. Bronin said it waited this long to celebrate the opening of year two because of an internal review of the Youth Services Corps. Bronin also said that the program is not in jeopardy. “Our goal, from the start, was to make sure that this wasn’t just a one-time, one-year thing, but something that would continue,” Bronin said. That means the city will have to continue to raise these funds from year-to-year to keep it going. This report was updated to correct the spelling of Tremaine Stamps's name.